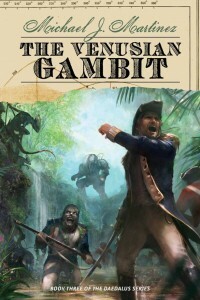 kt literary » Blog Archive » THE VENUSIAN GAMBIT in mass market paperback! THE VENUSIAN GAMBIT in mass market paperback! Fans of Michael Martinez’s DAEDALUS trilogy will be thrilled that THE VENUSIAN GAMBIT (Book #3) is now available in mass market paperback! That means the entire trilogy is available in trade paperback, ebook, audio and mass market – happy reading to all! This new edition also has a delicious teaser for MAJESTIC 12: INCEPTION – Michael’s historical spy thriller fantasy releasing September 6, 2016. “Overflowing with complexity and eloquence, the conclusion to Martinez’s Daedalus Trilogy (following The Enceladus Crisis) seamlessly blends popular elements from science fiction and fantasy, producing a work that raises the bar for both.” = Publishers Weekly, starred review! ← SOLD!!! Congratulations to Maggie Wells!